Liza Wang‘s (汪明荃) husband, Law Ka Ying (羅家英), has been fighting liver cancer for over a decade now. Diagnosed with stage III liver cancer in 2005, Kar Ying underwent chemotherapy and successfully went into remission. Unfortunately, doctors found a two-centimeter tumor in his liver during a check up this year. After being admitted to the hospital, high-energy radiation was used to eradicate the tumor before the cancerous cells spread. Although a seven-inch scar remains on his stomach area, Ka Ying slowly regained his health in the last six months. Known for his love of soccer, the 68-year-old was spotted running around playing soccer with his team at 3 p.m. earlier. Despite removing his tumor, Ka Ying’s strength impressively remains intact. While Liza Wang is known to be a workaholic–filming one series after another and performing in operas in the past–she realized the importance of spending more time with loved ones as she grew older. She cut down her workload to take more vacations with Ka Ying instead. 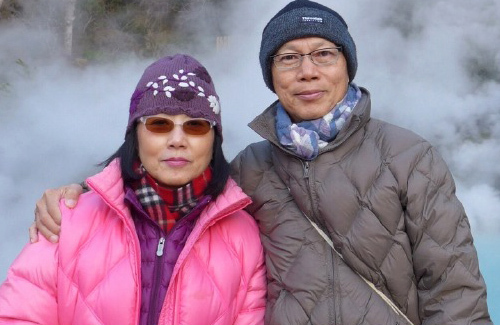 In 2014, Ka Ying and Liza have ventured to Taiwan, Paris, and Brazil during World Cup. Ka Ying revealed his exercise regime to maintaining good health after the tumor removal. Besides regular check ups, he plays soccer and golf. He makes sure to get enough sleep every night, and drinks a lot of water. He maintains a positive attitude and makes sure to continue enjoying life while dealing with his health situation. May all be well for him. He has been suffering from illness for quite some time. Hope it’s all clear for him. Wish him the best of health. Naturally I also like to see Liza returning for a little bit more tvb series. Same here. 😀 🙁 LOL! Wish you well, Kar Ying gor~ It’s good to hear the positive approach the couple are taking. Looks like Mr. Law is doing extremely well and has survived almost 10 years with his liver problem. I hear that Hong Kong is one of the best places to go for the treatment of liver cancer and usually after the 5th or 6th year the patient is considered cured of the disease if it has not recurred. Unfortunately this does not seem to be in Mr. Law’s case. Hopefully he will live many more years in spite of this setback. Liza is certainly doing the right thing be wanting to spend more time with him. How thoughtful and loving. I am so happy for Liza and Kar Ying Gor! They have been thru a lot together. First it was Liza Jeh with cancer, and then Kar Ying with his cancer. They have really stuck to their promise of supporting each other thru thick and thin. Wish them the best. I agree and their relationship and marriage is so touching. They truly show what love is and how you should be there for each through sickness and health and through thick and thin. Wish them both health and happiness. Did you ever watch Liza Jeh’s defining role as Lok Lam in “A House is not A Home”? Apparently, Liza’s first husband was beating her up then and she was seeking a divorce. Though she had thick makeup on, you can still the bruises and cuts on her face about two-thirds into the series. I felt so sorry for her and Angie Chiu who were both abused in their first marriage. I am glad that her 2nd marriage worked out so well. Liza Jeh used to be so uptight but since being with Kar Ying Goh, she has really opened up and actually looks and acts very happy despite their health problems! Do you guys remember them as husband and wife in the Sword of Conquest? There were only guest stars but their love and marriage in there was so touching just like in real life. They are another onscreen and off screen couple. I remember one scene where Liza what she was to Ka Ying and he said wife. However, she shook her head and said that she was his shadow. I thought that was so sweet.